How about an eye-searing jumble of work-in-progress images from Frayed Knights 2? Sure! I should have had an artist work on this, but it was late and I thought I’d show once again why I should stick with design and programming. Anyway, I was really trying to show some of the maps without actually, you know, showing the maps. But honestly the screenshots are generally cooler, even if some are kind of embarrassingly blemished with work-in-progress unfinished-ness. While I don’t really have a milestone to announce, in a way, this image dump represents the end of a lot of the early-phase, ‘pre-alpha’ stuff. Which is kinda funny, since I thought the demo we showed during the late-summer and fall was pretty polished and a good representation of the game. But it was still just a “vertical slice.” Since then we’ve been transitioning into making it a full (and probably too large) role-playing game. 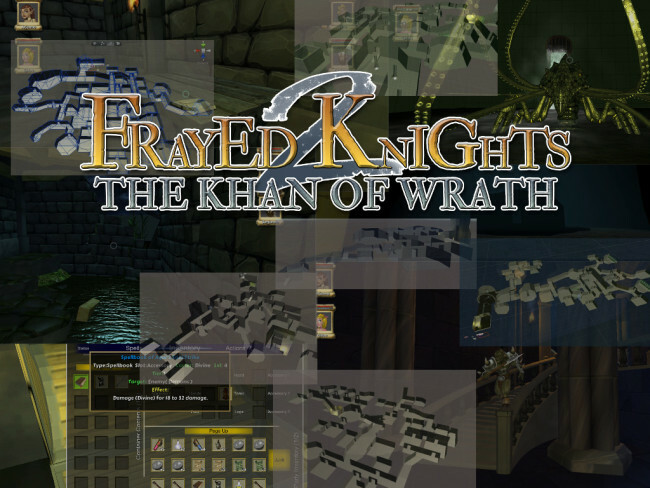 Over the last several weeks, I’ve focused on getting all of the levels in Frayed Knights 2: The Khan of Wrath complete enough to pass them off to the art guys. That means designed, whiteboxed, and navigable. The latter is a little tricky because I really like to make my levels impossible to just walk through from beginning to end, even before they are filled with locks, traps, and monsters. I like to have parts of the dungeon move, and these cool vertical areas that there’s a trick to navigating. That’s required some scripting. Anyway, I had a goal to get that done by the end of the year, and I fell a little short, although progress has accelerated and I can see the light at the end of the tunnel. There are more, and significantly bigger, dungeons in Frayed Knights 2. In part, this is because I’m compensating for eliminating the outdoor areas. In the first game, those were fun to explore once, but then took a long time to walk through and became a little tedious. They also consumed a lot of art resources for places that weren’t really a focal point of the game. So instead, the dungeon crawling is bigger and (I believe and hope) better. Unfortunately, that hasn’t led to a lot for me to talk about here on the blog. I don’t mind dropping a few teasers here and there, but I don’t want to go into too much detail. That’s the stuff that you’ll want to explore. It gets a little exhausting coming up with all the puzzles, tricks, stories, and and unusual situations in each dungeon. Just like the first game, I avoid having levels just be a sequence of fights (or fights and traps). For me, exploration means finding new, interesting stuff. So while every room might not be a cornucopia of fascinating delight and wonder, I don’t want to just drop a few orcs behind every door. I also approach the design of each level more like I would a dice & paper RPG. That’s not to say I don’t borrow “bits” from classic CRPGs. Those are in there too. But I find that thinking about the design in terms of a human-moderated game and then try to see how I’d translate it into the computer. Sometimes it doesn’t work, but other times it does. Worst-case, when I really love something but it doesn’t translate well, I keep it and use text and dialog to explain what’s going on. As always, if you hate reading text, this game might not be for you. We’ve still got a lot to do, but the pace is accelerating, and as I hope this dumb little image represents, we’ve come a long way. Over the next few weeks, I expect the screenshots will start appearing more regularly as I have stuff actually worthy of showing off. This is where things start really getting fun. And crazy. Neat, this looks like these things where people pour molten aluminium into anthills and dig it up. I like it that there are circular paths and also some side places, like in a real cave / cellar (some cities in the middle ages had networks of storage cellars). I liked the outdoor areas. They added to the sense of “realness” and made FK1 a bit more like open exploration sandbox. If all we get are one city and some dungeons, that takes away from the game, but I understand certain compromises have to be made to finish the game in the next 5 years. Yeah, the outdoor areas were a difficult call for me, especially since the original design had the entire first area be entirely outdoors (a bandit camp). It’s funny – a lot of the initial work I did on the game was cut completely. I chalk it up to a learning experience. As far as dungeons – I’m again trying to make them a bit more organically, relying upon certain choke-points to encourage a certain flow rather than the modern tendency for linear levels. And I’m not afraid of having players miss a quarter of the dungeon. If you skip the optional stuff… well, you skip it. No biggie. This is me designing levels like I designed them on graph paper, only with more vertical. The trick is trying to give each one a unique flavor – not just different textures. But players of FK1 already know what I’m talking about there. (A lot of that also has to go to Brian and Kevin for their creativity). > was cut completely. I chalk it up to a learning experience. I think you said here (or was it some other blog?) that the first area of the game should be made last, with the best skills and knowledge, so it fits the game well and hooks up the player, not turns him off with sub-par content. Another method might be to make the first level first, then remake / fix it before release. The Minotaur cave / labyrinth was especially made to be confusing and it was one of the more memorable places in FK1. I liked it. Congrats on the progress. Exciting!